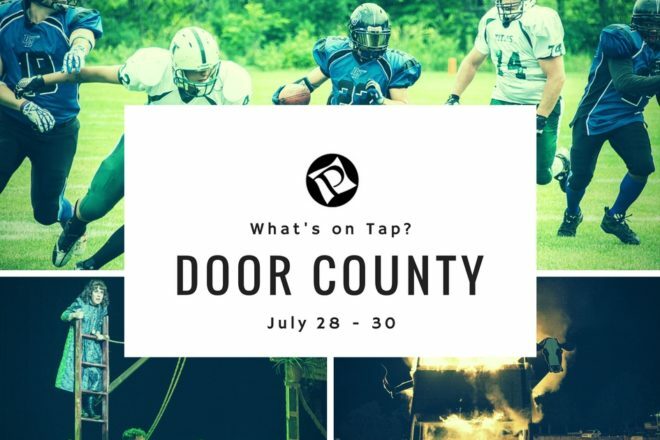 The arts and entertainment in Door County continue with more offerings to the public as we wrap up July. From music festivals to new theater productions, and even a little semi-pro football, there are more than enough events to keep the whole crowd entertained. Sneak up for a getaway to enjoy the sunshine and all the Door County arts community has to offer. Door County has its own ‘Burning Man’ festival. Instead of a man, though, a huge bovine effigy is burned . Southern rock, blues, alt-country and jam bands comprise this year’s line up. The festival is held just west of Valmy and runs Thursday through Saturday. Third Avenue Playhouse’s latest show, a sly and witty operetta styled after Voltaire’s 18th century novella, begins this weekend. Scored by the legendary Leonard Bernstein and with lyrics written by Stephen Sondheim and others, Candide is one of the most well-known musical theater pieces of the 20th century. Stop by TAP’s stage in Sturgeon Bay to witness an instant classic. Show begins at 7:30 pm. “What if…?” is the question of the hour as Peninsula Players opens their next musical, Bridges of Madison County. An Italian beauty finds herself in rural Iowa after World War 2 in this Tony Award-winning production. Over the course of four days while her family is absent, the course of her life may change even more than it already has. Peninsula Players theater is located just north of Juddville on Highway 42. Show starts at 8 pm. pat mAcdonald is synonymous with the rock and blues scene of Door County, as co-founder of the nonprofit music festival Steel Bridge Songfest. The night will be a celebration of the man and his music. Come out for a potluck preceding the show at the Fish Creek Door Community Auditorium at 6 pm followed by the show, featuring the musicians of Steel Bridge Songfest, at 8 pm. Haven’t gotten enough cherries for the season? Stop by Door County’s largest cherry operation to celebrate the season by making your own cherry pies, live music, and even a cherry pie eating contest. Located north of Sister Bay on Highway 42, the Orchard Market will be hosting the festival from 11 am – 3 pm. Semi-pro football at its finest. Stop by the Baileys Harbor Rec Park to enjoy a game of football months before the NFL gets going. 100 percent of online ticket sales go toward the Door County Humane Society, and a 50/50 raffle at the game will also go to support the organization. Game starts at 4 pm. Hosted by the Devil’s Knights Motorcycle Club. Starting at the Tippy Canoe in Casco and ending at Waterfront Mary’s Bar & Grill in Sturgeon Bay, proceeds from the ride go to Sturgeon Bay’s Sunshine House Inc., a special needs community center. Registration begins at 11 am, ride begins at 12 pm. Motorcycles, trucks, and cars welcome. “From page to stage in three weeks.” Open Door Theater presents their original production, The Conversation, which examines both the conversations we aren’t having that we should as well as the conversations we have that perhaps we ought not to be having. The show opens Thursday and runs through the weekend, with a matinee showing at 2 pm on Sunday. Open Door presents its plays at Crescent Studios in Fish Creek. Country and bluegrass legends Jamie Dailey and Darrin Vincent and their band come to Egg Harbor’s outdoor PAC for a free sunset concert. Recipients of multiple Grammy Award nominations as well as awards from the American Bluegrass Music Association, the Nashville-based group has been impressing audiences with their technical ability as well as their beautiful country vocal harmonies. Show begins at 7 pm.